If you are faced with a survival situation that is going to be extended for any length of time, one of the key issues you’re going to be faced with is how you’re going to forage for food and this would include eating animals, small mammals and other edible insects. Once you know where to look and what is safe to eat, you’d be amazed at the abundance of animals and insects you’ll have access to if you’re stranded in a wilderness area in addition to the plants and vegetation all around you, much of which will be edible. The biggest hurdle you’re going to have to conquer is your attitude to eating insects in a survival situation but once you’ve overcome these fears, you’ll truly begin to understand the nutritional value of eating edible insects. They are actually higher in protein and fat content than most meats and come packed full of vitamins and minerals. Insects should not be too difficult to locate simply by looking all around you, especially on the ground, and by carrying some form of container, you should be able to gather a significant amount. However, to be even more successful, you need to understand the insects’ habits. That means, searching out rotting wood and looking within it and underneath it. Rocks also provide shelter for edible insects so look underneath them and try to look for other sheltered spots such as nests on the ground where insects may choose to lay eggs or spin cocoons. Once you are adept at understanding what insects are safe to eat, you’ll get to learn that many insects can actually be eaten raw but, if in doubt, it’s always safer to cook them first and they’ll also be a little more palatable if cooked. 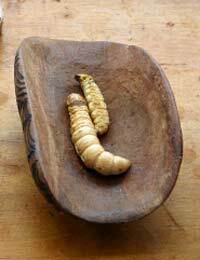 They can be added to food such as stews and soups, eaten with some vegetation or even roasted. Before eating any insect, you should remove any barbed legs and also the wings. Insects that should be avoided should include any that give off a bad odour. Brightly coloured and hairy insects should also be left alone as well as any insect that stings or bites. There are no hard and fast rules, however, so you should do your homework first. There is another article contained on this website which will give you information about trapping small animals but other creatures that you might also wish to forage for would be amphibians and reptiles. Frogs offer up an ideal protein source and can often be found around any area of fresh water. You shouldn’t confuse them with toads, however, many species of which can be poisonous. Avoid any brightly coloured frogs however, as these can also be poisonous. Certain reptiles are also edible and many are relatively easy to catch. That said, it goes without saying that you should steer clear of trying to catch and kill any poisonous snakes. Whilst it’s always best to cook reptiles first, because they are cold-blooded they don’t carry the same blood diseases of their warm-blooded counterparts. However, when eaten raw they can transmit parasites. Apart from other animals you can go trapping for meat and the fish you can catch, other sources of nutrition can come from worms, certain crustaceans and mollusks and so if you’re near a water source, you’re going to have far more options. For those of you who enjoy wilderness camping or have an interest in survival, the best advice is to get yourself a good book from which you can learn all about the different animals and insects which are safe to eat (and those which aren’t) which could mean the difference between life and death in a survival situation.